Experts are not immune from making mistakes, even really bizarre ones. Ahem. Take James Weddell for instance, a keen observer of pinnipeds and other marine life (Fogg 1992) who somehow produced the monstrosity above. The intended subject isn’t any old seal, it’s a Weddell Seal (Leptonychotes weddellii)… mostly. The circumstances behind this illustration are vague and contradictory but Fogg (1992) reasoned it was based both on a specimen deposited in the Edinburgh Museum* and Weddell’s memory of wild seals, which may have conflated Weddell and Leopard Seals. It’s probably notable that Weddell referred to his namesake as a “Sea Leopard”. * Now the National Museum of Scotland. 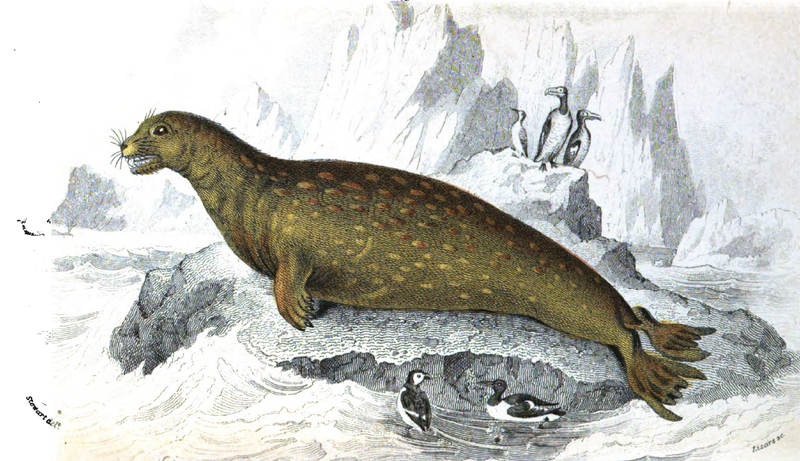 Weddell (1825) included a brief description of his preserved specimen from one Professor Jamieson who noted the “long and tapering” neck and small head, and argued that Weddell’s Seal had dentition distinct from a Leopard Seal’s. 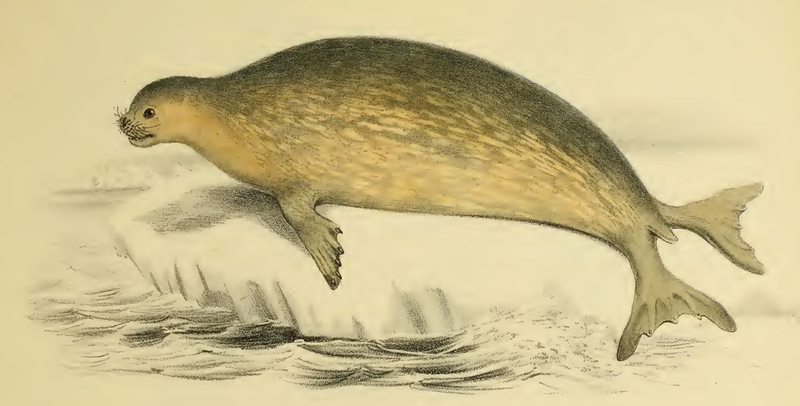 The following year René Primevère Lesson named the species “Otaria weddelli” from Jamieson’s description and Weddell’s illustration but not an actual examination of the specimen, which apparently means Weddell Seals don’t have a proper type specimen (Scheffer 1958). Nobody seems to know why Lesson classified Weddell’s Seal as a Sealion (hence “Otaria“) although I’d suspect it was due to the slender neck. So… what’s up with that mysterious neck? Hamilton (1839) described Weddell’s specimen as having a “proportionally very small” head and a “small, long, and tapering” neck, however the accompanying illustration makes it clear these traits are quite subtle, at least compared to Weddell’s illustration. Hamilton (1839) also took measurements — unfortunately “over the back” — but it’s still interesting that the distance from the snout to the base of the fore-flipper is 1.04 meters compared with a snout-tail length of slightly under 3 meters. It would seem remarkable for a “true” seal to have a head and neck length around one third that of the body, but in fact, it’s totally normal. Weddell Seal in a more typical pose. From Richardson & Gray (1845). Despite external appearances, seals and sealions have necks that are proportionally similar in length, although seals typically hold theirs in a deep “S” curve (Rommel & Reynolds 2002). I would highly recommend clicking on this link — the disparity between the external “neck” and the length of cervical vertebrae is truly astounding. As for why seals do this, it’s for “slingshot potential” to capture prey (Rommel & Reynolds 2002), so they’re apparently like snapping turtles, except they hide their necks in blubber rather than a shell. Anyways, Weddell Seals have cervical vertebrae that take up 14% of the vertebrae column (including the tail), and the series is slightly longer than the condylobasal length of the skull (Piérard 1971), so the proportions described by Hamilton are indeed plausible. The posture still seems odd — I can’t find any photographs of a Weddell Seal in such a pose — and I wonder if whoever mounted Weddell’s specimen did so Leopard Seal-style, since that species appears to hold its neck out fairly straight for a “true” seal. It would be interesting to see what the mount actually looks like, but unfortunately, I haven’t been able to track down any photographs. I can’t help but think of Parson’s long-necked seal and if that was another example of a specimen mounted with an extreme posture whose morphology was exaggerated even more by an illustrator. Curiously, some early workers considered Parson’s and Weddell’s seals to be synonymous (Hamilton 1839), but whatever Parson’s seal was, it probably wasn’t an Antarctic visitor. Allen, J. (1905) The Mammalia of Southern Patagonia. Reports of the Princeton University Expeditions to Patagonia 3(1) 1–210. Relevant Passage. Fogg, R. (1992) A History of Antarctic Science. Relevant Passage. Hamilton, R. (1839) The Natural History of the Amphibious Carnivora. Available. Relevant Passage. Richardson, J. & Gray, J. (1845) Zoology of the Voyage of the H.M.S. Erebus and Terror. Available. Relevant Passage. Illustration. Rommel, S. & Reynolds, J. (2002) Skeletal Anatomy IN: Perrin, W. et al. (eds.) Encyclopedia of Marine Mammals. 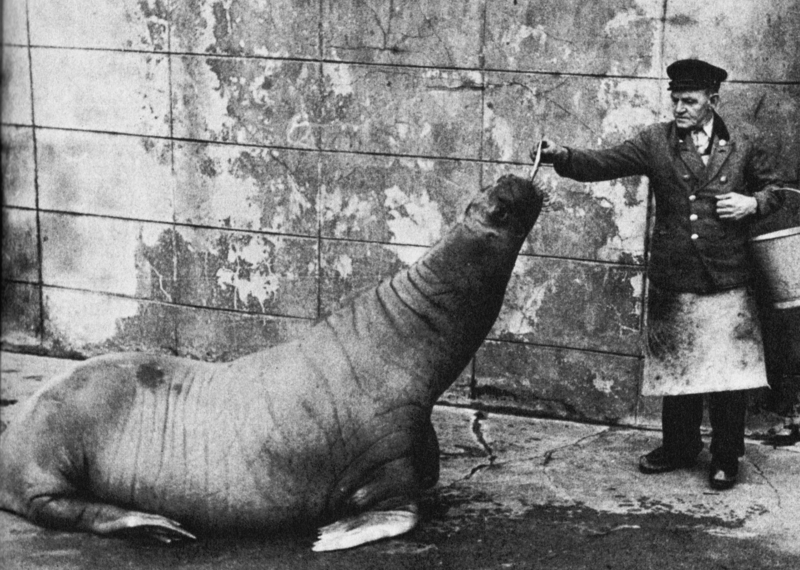 Scheffer, V. (1958) Seals, sea lions, and walruses: a review of the Pinnipedia. Weddell, J. (1825) A Voyage Towards the South Pole. Second Edition Available. Relevant Passage. This entry was posted in Anecdotal Evidence, Carnivorans, Mammals, Old Stuff, Species Discoveries and tagged Anecdotal Evidence, Carnivorans, Leptonychotes weddellii, Pinnipeds, Species discovery, Weddell's Seal on March 4, 2013 by Cameron.